The day started out with a first of year Warbling Vireo singing in the big box elder by the bridge over the Brandywine. Shortly after that a Orchard Oriole flew into the downed tree just beyond the bridge. And that was the end of the bird excitement for day. After that it was pretty slow. Swallow numbers were way up with hundreds flying over the fields near the Brandywine. The composition was roughly 70% Tree, 20% Northern Rough-winged, and 10% Barn. I usually spend a fair amount of time scanning big groups of swallows like this looking for Cliff and Bank Swallows, but I always come up empty handed. Blue-gray Gnatcatchers still seem to be dominating the small tree dwelling birds. They seem to be everywhere. For the most part, however, the woods were very quiet today. I checked the wetland (above photo) where I saw the Rusty Blackbird yesterday and other than 3 male Wood Ducks it was birdless. 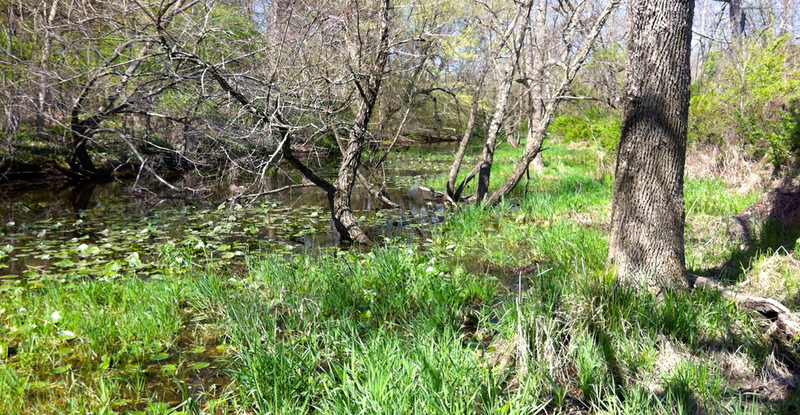 The wetlands and the wooded drainages in the preserve have some impressive native plant communities. It is a good place to spend your day when the birds are not moving! Rock Dove – 2, a fairly uncommon bird in the preserve. The last ones that I observed were way back on 12 February! Blue Jay – approximately 40, small groups mostly flying due east. William is in, Paddy is on Deck!